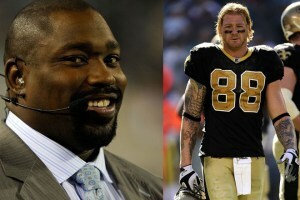 Jeremy Shockey was the whistle-blower in the NFL’s investigation into the New Orleans Saints‘ pay-for-performance system that resulted in a slew of sanctions Wednesday, according to former NFL defensive lineman Warren Sapp. The allegations — which might have violated federal labor laws — drew a swift rebuke from Shockey on his Twitter account. Read the full story after the jumpShockey said the next thing he will be blamed for is the unsolved disappearance of union boss Jimmy Hoffa — who vanished five years before Shockey was born — and the recent scandal at the University of Miami, where players at Shockey’s alma mater allegedly received impermissible benefits. Shockey, a tight end, played for the Saints from 2008 to ’10. In announcing its punishments, the NFL said the Saints, under former defensive coordinator Gregg Williams, had an active bounty program from 2009 to ’11. The determination led to a one-year suspension of Saints head coach Sean Payton, a suspension of indefinite length against Williams, who was recently hired by the St. Louis Rams, and other suspensions and loss of draft picks. The league didn’t release what sparked the investigation. Federal labor law protects employees against retribution as result of complaining about unsafe work environments. The fact that Sapp, an analyst for the NFL Network, might have outed a whistle-blower could pose a problem for Sapp and the league, Los Angeles-based employment lawyer Arthur Whang told FOXSports.com. Shockey, who played last season in Carolina, is an unrestricted free agent. Whang added that if Sapp’s actions could also have a chilling effect on future NFL employees coming forward to expose wrongdoing for fear of retribution. NFL Network spokesman Dan Masonson said Sapp was unavailable for comment. Masonson also declined to comment on the possible labor law violations. This entry was posted in GET "TFOH" and tagged Jeremy Shockey, Jeremy Shockey Whistle-Blower, New Orleans Saints, NFL, Saints Bounty Program, Warren Sapp. Bookmark the permalink. damn sapp has been a victim of the same type of reckless media he should know better.